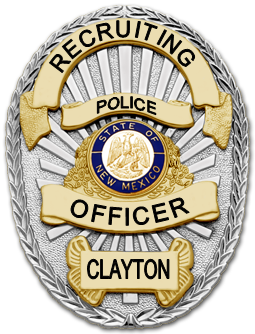 New Mexico certified Officer Applicants may hire in between Steps 1-4 based upon years of experience. Out of state certified lateral 18.00. Step plan will begin upon certification. Non certified applicant 16.50. Step plan will begin upon certification. Officers must receive a satisfactory annual performance evaluation in order to move foward in the step process. Officers are required to work an 86 hour pay-period resulting in additional salary. A $1,500 sign on bonus is offered to NM certified applicants. Bonus is paid as follows, $750 upon hire, $750 upon probation completion *Two year employment agreement required in order to receive the bonus. (Bonus is contingent upon funding availability). Grant funded overtime for enforcement projects throughout the year. Officers participate in the State of New Mexico 20 year P.E.R.A. retirement plan. Officers contribute 6.2% of their salary with the Town contributing 20.6%. Officers may retire at any age with 20 years of service. Non-commissioned employees are eligible to retire after 25 years of service regardless of age. Vacation leave is accrued at 40 hours after first year. 80 hours after second through fifth year. 120 hours after sixth year. Vacation hours are payable upon seperation from City services. Sick leave is accrued at 8 hours per month. Employees with six or more years of service may cash out a portion of sick leave hours upon seperation from City services. Personal holiday is provided at 8 hours per year. Overtime is provided after 86 hours. Comptime is rated at 1 1/2 times. Holiday pay for employees on duty status is paid at 1 1/2 times . Employees on regular day off are paid straight time. Officers are provided with uniforms, weapons (Glock 40, AR-15, Shotgun) body armor, taser, all equipment and a take home patrol unit, In car mdt. 4 ten hour shifts with 3 days off. Medical Plans: The Town of Clayton contributes 100% of the employee only premium for health, dental, disability and vision. The Town of Clayton offers two different health plans from which to choose with the Town paying 100% of the premium for the Employee. One is statewide health maintenance organizations (HMOs): Presbyterian Health Plan.The other provider organization is (PPO): Blue Cross/Blue Shield State of New Mexico PPO. The Blue Cross/Blue Shield of NM PPO plan provides choice and flexibility in benefits on a nation wide basis. Members do not need a referral to access specialist care. You are not required to select a Primary Care Physician (PCP). When you visit a Blue Cross/Blue Shield contracted PPO Primary Provider (PCP or OB-Gyn) you will have access to that care at the lowest out of pocket costs. This plan includes the flexibility to visit any licensed provider outside the Blue Cross/Blue Shield network at any time. Again, you do not need a referral or need to select a PCP, but your out of pocket costs will be higher. Please refer to your summary plan description/benefits summary for full details. Additional information can be obtained by visiting www.bcbsnm.com/sonm/. The Town currently offers Delta Dental PPO New Mexico. You are guaranteed the lowest cost when you select a PPO New Mexico Dentist, who agrees to accept Delta Dental's discounted fees and charge you only the applicable co-payment, deductible and tax. PPO New Mexico is a statewide PPO network offering you full benefits under the plan with no hidden costs or surprises. In fact, PPO New Mexico dentists will give you an estimate for you out-of-pocket expenses prior to treatment. You may visit a dentist who does not participate in PPO New Mexico or any Delta network. However, your costs may be higher when you visit a non-Delta dentist.Please refer to your summary plan description/benefits summary for full details. Additional information can be obtained by visiting www.deltadentalnm.com. Vision Service Plan administers vision coverage for the State of New Mexico. For additional information please visit www.vsp.com. Due to 2010 budget cuts to the EAP, beginning July 1, 2010, the EAP will offer a one visit assessment and referral plan for employees and family members per problem per year. The assessment visit can be face to face or telephonic with a targeted referral to available community counseling providers or through the employee's health plan providers with expertise in the issue. The Deer Oaks website access continues to be available for standard training presentations. Other website resources remain the same to assist in finding resources and options for HR and employees to help when life issues arise. inter-personal problems with co-workers and supervisors. Deer Oaks offers multiple modalities of counseling including individual, couples, family, and group counseling. For more information, visit www.sonmeap.com. The Town offers Term Life and Accidental Death and Dismemberment (AD&D) insurance. Supplemental Term Life coverage if offered to employees who wish to an elect an amount in excess of the basic $50,000 package. The cost for coverage is based upon age and the amount of supplemental coverage elected. As a new hire you may elect an amount up to three times your annual salary without Evidence of Insurability. Employees can elect four times and five times your annual salary after completing an evidence of insurability form and having it underwriting by Standard Life. The maximum amount of coverage is $400,000. If you do not elect the Basic Life/AD&D or Supplemental Life as a new hire you may be subject to underwriting and denial. Dependent Life Insurance is offered at a flat rate - it is the same premium for coverage regardless of the number of dependents. You may enroll your spouse for coverage in the amount of $10,000 and you may enroll dependent children for coverage in the amount of $5,000. For more information on the Basic Term Life / AD&D Insurance benefit please visit www.standard.com/mybenefits/newmexico_rmd/life_add.html. GSD-Risk Management Division administers the State of New Mexico Short/Long Term Disability program. If you enroll in the Basic Term Life Package you will automatically be enrolled in the STD/LTD program. If you become disabled and apply for benefits under this plan you must complete a period of 7 days during which no STD benefit is paid. This is called the elimination period. The STD disability payments will be calculated at 60% of your weekly earnings to a maximum of $500 per week. If the combination of your benefits plus sick leave exceeds 100% of pre-disability earnings, your STD benefit payment will be reduced to the level that does not exceed 100% of your pre-disability earnings. The maximum period of payments is 24 weeks. After exhausting your Short Term Disability benefits, you will automatically be eligible for Long Term Disability coverage if you are still disabled at the end of your STD benefit. The weekly benefit of 60% of your weekly earnings under Short Term Disability will transition to a single monthly payment of 40% of your monthly earnings to a maximum of $2,000. NOTE: Under the long-term disability portion of the plan, once you are eligible for Social Security Disability or PERA retirement you will no longer be eligible for the State of New Mexico disability. For more information on Short-Term and Long-Term Disability coverage please visit www.generalservices.state.nm.us/rmd/disability.html. Large or small issues can weigh heavily on your mind and compromise your quality of life. Information regarding these questions you might have toward your goals can be answered through the legal and financial plan offered through the State of New Mexico. For additional information regarding Legal or Financial Issues please visit members.ARAGgroup.com/NM. Minimum requirements: 21 years of age or older for officer, 18 years of age or older for non-commissioned positions, high school diploma or ged, valid drivers license with no adverse driving record, United states citizen, no felony convictions or crimes of moral turptitude, be of good moral character with a stable employment history, submit to and pass a thorough background investigation along with a drug and alcohol screen. Non certifed officers are required to complete the 16 week New Mexico law enforcement academy within one year of hire. Out of state certified laterals are required to complete the certification by waiver exam at the law enforcement academy within one year of hire. Applicants may visit www.dps.state.nm.us/training/index.php for further academy requirements. * Non certified applicants are required to submit to and pass a physical agility test prior to participating in the oral board interview. * A two year employment agreement is required for non certified/out of state certified laterals and dispatch applicants. We are seeking talented individuals that are community/customer oriented and believe in making a positive difference. Applicants that do not possess a stable work history will not be considered.